For five kids in Murakawa Village, summer vacation begins with a week of...school. 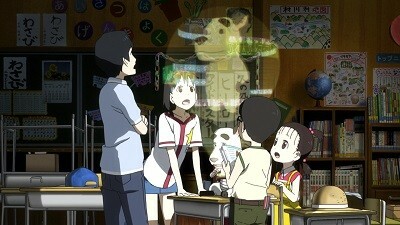 Fifth-grader Natsuki (Tomoyo Kurosawa), her younger, second-grader cousin Amane (Honoka Ikezuka), sixth-grader Kiyoshi (Shotaro Uzawa), fourth-grader Noriko (Tamaki Matsumoto), and third-grader Koji (Takuto Yoshinaga) gather at the schoolhouse for a week of unsupervised extracurricular activities. Natsuki and Amane are fighting over the disappearance of the schoolhouse pet, a rabbit named Pyon-Kichi, who ran away while under Natsuki's supervision. They agree to look for him, but instead discover Pochi (Keiji Fujiwara), a creature that looks like a dog but is actually a researcher from outer space, trying to locate a plant called Zughaan. The students patch him up, and are delighted when he awakes and reveals he can speak. As a reward for saving his life, he offers to take them on a field trip to the moon, kicking off a wild and emotional summer vacation unlike any they've had before. Just like the kids' space adventure, Welcome to the Space Show is a rollercoaster ride of ups and downs, ultimately worth a look but not without some noticeable flaws. 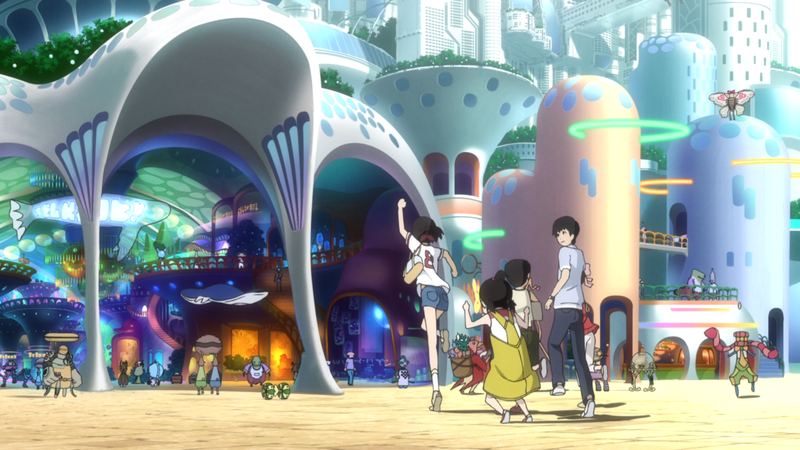 It's the feature debut of director Koji Masunari, who previously worked on a number of hit Japanese anime shows with screenwriter Hideyuki Kurata and character designer Masashi Ishihama. Together, the trio take the viewer on a visually spectacular, imaginative journey with a group of well-rounded and interesting characters, but they struggle to leave their television roots behind, with a story that frequently feels episodic and overlong. When the project was announced, the producers boasted that the story would "surpass Star Wars in its scale." Space Show has enough going for it that such a boast isn't entirely unfounded, but sometimes it feels like they tried to match the scale of the entire original trilogy. The most refreshing thing about the film is its boundless inventiveness. The very first stop on the class' adventure is a massive outer-space plaza, complete with a vast artificial ocean surrounding, located on the dark side of the moon. What's especially pleasing about the scenes that follow is that they aren't just a collection of aliens walking around, but an entire world that feels as if it exists beyond the borders of the movie. The kids are asked to pass a test before being allowed to enter the station with interesting sociological implications. Minor details of Pochi's job are revealed. The characters even figure out what the currency conversion is between yen and the pods that Pochi pays with. The group later ventures on to other worlds and environments, each different and varied, each of which offers enough intrigue and invention that it seems as if it could sustain an entire film all by itself. Plenty of movies create worlds for the characters, but so many feel restricted to the story at hand. Space Show is more open-ended, as if we're only seeing one version of a Choose Your Own Adventure movie. The flipside of this is that large chunks of the film can feel a bit aimless. The film's narrative momentum could charitably be described as casual, with more focus on characters and their emotional bonds than plot. It's certainly commendable for a film to take time developing its characters, but many of these scenes feel like tangents. At one point, the characters all get day jobs to try and earn some pods, which is a mini-arc unto itself. Each new location provides another opportunity for the characters to investigate it, including a rainy day montage where nothing of note happens. At times, this can make Space Show feel more like a television show than a movie, with each new world Pochi takes the characters to serving as another episode, complete with little cliffhangers. Frankly, spending time in the world of the film is enjoyable enough that a miniseries might not have been a bad idea, but the 136-minute film that was made instead is unwieldy. The film's central conflict involves Pochi's target plant Zughaan, which is so rare in space that many of the aliens the characters encounter believe it's a myth. 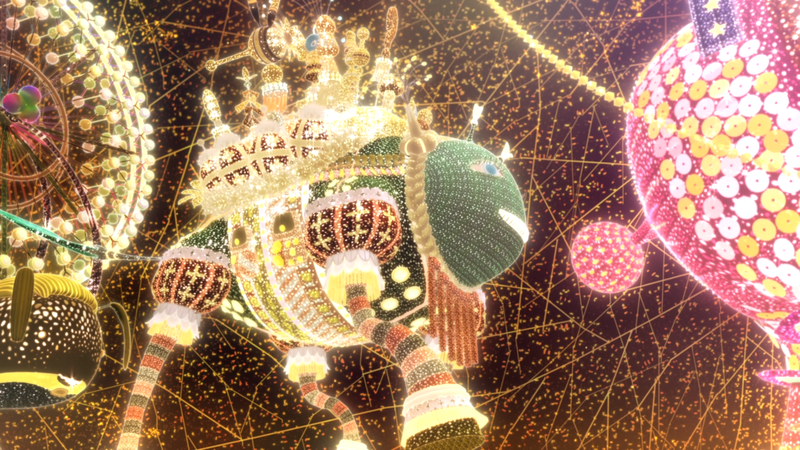 Three aliens chased Pochi to earth to try and poach it from him, but return to their mysterious boss empty-handed. When the students arrive on the moon, it turns out they may have Zughaan in their possession, and the result is a chase across various galaxies to try and get it from them, all building to some nefarious plan. 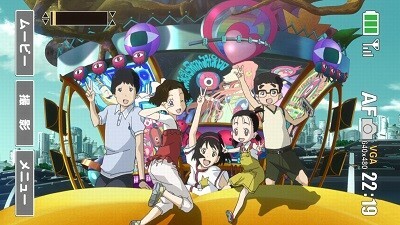 As the film finally moves into its home stretch, it starts bringing elements together, including the fight between Natsuki and Amane, a young alien pilot named Ink (Mayu Iino) that Koji meets, and the universe's #1 television program "The Space Show", hosted by one-eyed alien Neppo (Ryohei Nakao) and Marie (Rei Igarashi), who may or may not be an old acquaintance of Pochi's. The final place the characters travel to is not just the most spectacular, but also the most exciting, serving up a complex series of action sequences involving all the characters. On the downside, these sequences, and the movie at large, is oddly saturated with emotion, piling on the regret and remorse so heavily that the film inadvertently becomes a downer from time to time. It's yet another case of Masunari losing sight of moderation, but maybe that's what makes the movie special: when so many films are packed with half-baked ideas and missed opportunities, a movie that is overinspired, overlong, and overemotional is kind of a breath of fresh air. Cinedigm brings Welcome to the Space Show to Blu-ray with a colorful package in pastel pinks, blues, and yellows that captures the film's vibrant visual palette. The single-disc release comes in a non-eco Blu-ray case wrapped inside a foil slipcover, both of which feature the same basic artwork, with some of the box copy on the rear left off of the slip. There is no insert inside the case. The disc is graced with an impeccable 1:78:1 1080p AVC transfer and a Japanese DTS-HD Master Audio 5.1 track, both bursting with the energy and spectacle that the film wishes to provide. A digitally animated film generally doesn't have much to worry about other than the other content it shares disc space with, aliasing, and banding, and aside from the opening fade (which may have a tiny bit of banding), the visual presentation is free of any of these things, in addition to offering excellent detail in the more complex shots and brilliant, eye-popping color throughout. The movie also kicks things off with an action sequence that will give viewers' surround sound systems a nice workout, with others spread throughout the movie. Some nice beefy bass and incredibly diverse environmental effects help place the viewer aurally in the world of the movie, even during otherwise mundane dialogue scenes (pretty much everywhere the characters go in space is a crowd scene with all sorts of fantastic devices and surroundings that provide all sorts of creative opportunities for sound effects). The disc also offers an English DTS-HD Master Audio 5.1 dub, and obviously includes English subtitles. The primary extra -- so much so that there is a sticker on the slipcover boasting its inclusion -- is either a special or an episode of a series titled "The Creator", from the Japanese anime network Animax, featuring director Koji Masunari (1:25:28, SD). This eight-part special finds Masunari chatting about the process of making Welcome to the Space Show with the program's two co-hosts (MC Kendo Kobayashi and Chiaki Kyan), in a lengthy, free-roaming discussion that touches on every aspect of the film's four-year production process. It's a mixed bag: certainly, such a lengthy extra is appreciated, but it's also akin to serving up a 90-minute late-night talk show interview as the making-of documentary for a movie. For every tidbit of great information, there's ten moments of empty banter and filler information, as well as numerous clips from the film. It's also just so long that even the biggest Space Show fans will probably have to break it up into the segments outlined by the disc's chapter stops, as watching it in one go becomes fairly tedious. Again, it's great that it's on the disc, but traditional behind-the-scenes featurettes probably could've provided the same amount of insight in a fraction of the time. The only other extra is a storyboard to film comparison (7:47, HD), which offers a side-by-side window with the finished film on the left and storyboards on the right. It's an interesting look at how an animated film is directed that shows how keyframes get turned into a sequence. Trailers for Ernest and Celestine, A Letter to Momo, and From Up on Poppy Hill play before the main menu. Two original theatrical trailers and two TV spots for Welcome to the Space Show are also included. Although it's got a fair share of shortcomings, fans of animation will want to check out Welcome to the Space Show just to see the sheer volume of visual and conceptual creativity on hand, which bursts from this film like a jack-in-the-box. The film can be overwhelming at times, but even the slight sickness of taking in so much cinematic sugar won't dampen the overall experience. Recommended.